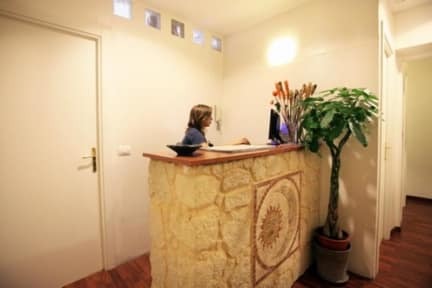 The Sole e Luna B&B, is a Bed and Breakfast situated in the center of Rome, just two steps from the station Termini and from the Colosseo, in splendid palaces of ancient age. We are in Via Merulana, between the Basilica di Santa Maria Maggiore and the Basilica di San Giovanni, very well connected with Metro stations and bus stops. The area offers many places for eating and shopping. Pleasant and different types of private rooms, from the single to the quadruple with the possibility to reserve a room with private bath. Maximum cleanliness and courtesy are guaranteed, 24h presence and an ideal position. We try to satisfy all your requests of information on the city. Moreover breakfast (Italian) is included in the price. Payment: Only cash on arrival at the guesthouse. It had been my first visit to Rome. The hostel is at a very good position. 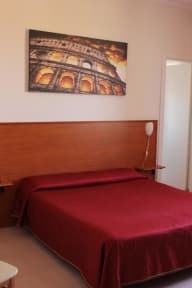 10 minutes to Manzoni Metro Line A and max 20 minutes to Termini, 30 min to the Colosseum. I've read the hostel was hard to find before, but i guess the people running the hostel read the reviews and did something about it. The people were nice, the room big and clean. Maybe a bit loud but im from berlin so i use to live at the street. Recommend this hostel! Anfangs hatten wir etwas Probleme die Unterkunft zu finden, da außen am Gebäude kein Schild war. Wir konnten unser Zimmer erst ab 15 Uhr beziehen, obwohl 12 Uhr angegeben war. Das Zimmer war groß und sauber und mit Kühlschrank, worin am Vormittag nach dem Putzen das Frühstück für den nächsten Tag gelagert wurde (Croissant, Zwieback, Marmelade, Joghurt,Milch). Die Lage ist perfekt, man ist in ein paar Minuten am Colosseum. Die Unterkunft ist für einen Städtetrip absolut ok.